Fishing is a popular water sport across the state of South Carolina; from the freshwater streams and rivers of the Upstate to the coast of the Atlantic Ocean, South Carolina offers unique fishing experiences for many skill levels and interests. Use this page to find out more about species, rules and regulations, and fish consumption. 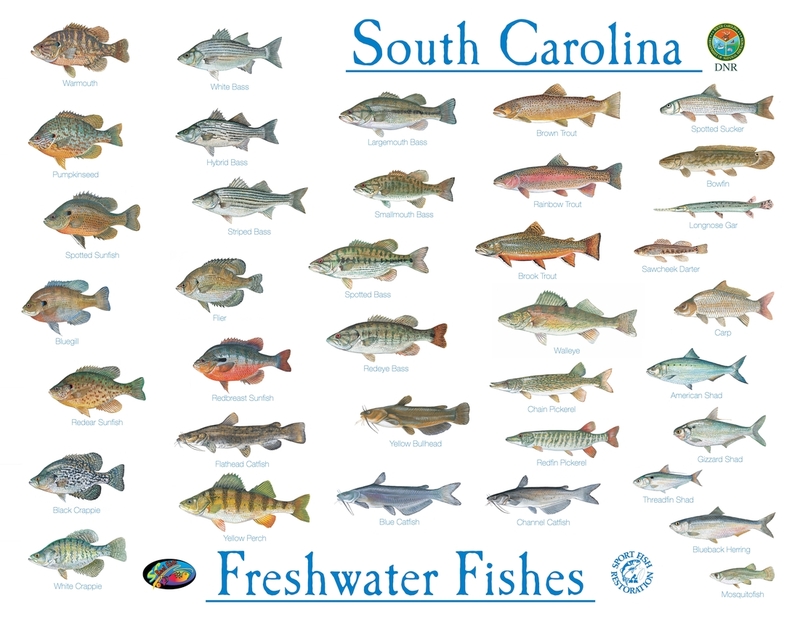 Additionally, the South Carolina Department of Natural Resources has a wealth of fishing information on their website! Whether you are a resident of South Carolina or just visiting, be sure you have a current fishing license. Fishermen over the age of 16 are required to obtain a fishing license before fishing in freshwaters or saltwater unless you are fishing on a privately-owned pond. The rules and regulations for saltwater fishing are different from freshwater fishing. Learn more about the rules and regulations and obtain a license before you fish! The South Carolina Department of Natural Resources and DiscoverSouthCarolina both have great beginner's guides to fishing. Learn more about equipment, where to fish, and common fishing practices. Whether you are fishing to enjoy the outdoors, spend time with family, or catch dinner, you should always be safe about the fish you eat. The South Carolina Fish Consumption Advisories from the South Carolina Department of Health and Environmental Control tells you where you should limit the amount of fish you eat and where it is safe to eat as much fish as you like. A "Fish Advisory" will list a lake, stream, or river in South Carolina and tell you the type of fish and amount of fish that it is safe to eat from that waterbody. Waterbodies not listed on the SC Fish Consumption Advisory list are generally safe to consume fish - it means that SC DHEC has not issued any consumption advice. Advisories help you decide where to fish, which fish to keep, and how much fish to eat. Conserve Native Species. Never release aquatic organisms into waters other than those from which they were caught. Don't Dump your Bait. Only dump your bait bucket back into the waterbody where that bait was collected. Look Before you Cast. Always check behind and next to you before casting your line. Keep at least one rod's length between you and the next angler before, during, and after your cast to prevent hooking power lines, trees, or people. Be Considerate of Other Anglers. Respect other anglers' space and keep quiet so as not to disturb others - or the fish! Loud noises can scare fish away. Photo courtesy of Blueway Adventures.